Language: Catalan, Spanish and English. Are you a field scientist and strong defender of the environment? These studies are aimed at providing future professionals with the skills needed to face the scientific, technological and academic challenges of human development and its effects on the Earth's system through a multidisciplinary, holistic approach and with a strong presence on the field. The objective is to use the planet's resources in a sustainable way to improve its inhabitants' living conditions. By choosing this double degree, you will receive two diplomas in environmental science and in Geology. The bachelor's degree in Environmental Science and Geology lasts five years (342 ECTS credits). During the first three years, it combines subjects from both degrees. After the 3rd year, you can choose a specialisation by enrolling in 19 optional subject credits. Thus, 9 optional credits in environmental science are taken in the 3rd and 4th years, and 10 optional credits in geology are taken, 6 in your 4th year and 4 in your 5th year. This degree contains many hours of fieldwork and laboratory sessions and in the interpreting of geological maps. The degree also contains an optional work placement programme (optional in environmental science) and a mandatory one in geology. It also offers a double exchange programme with a large number of prestigious universities in both environmental science and in geology. In your 5th year, you will focus on two final degree projects (15 credits in environmental science and 6 credits in geology). Prevention, analysis, control and treatment of pollution. Geotechnics applied to civil engineering and environmental planning. Environmental impact assessment and auditing. Regional organisation and strategic planning. Geological consultancy and environmental management. Exploration, exploitation and management of mineral, energy, water and forest resources. Management of waste collection points and waste recycling. Teaching in secondary and higher education. Environmental and scientific education and communication. Mediation in environmental and geological conflicts. "It is a combined degree focusing more on hands-on practical experience than theoretical lectures, you learn to observe the world better and gain knowledge which is cross-disciplinary, very tangible and useful for everyday life." Exchanges with European universities (Erasmus+). 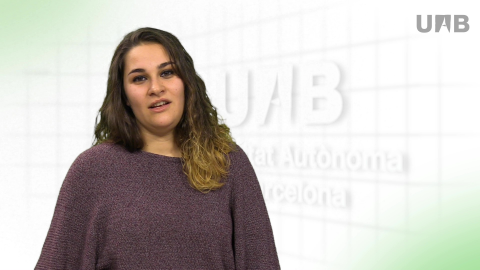 UAB Mobility Programme with universities around the world. Work placements in geology-related companies are compulsory. These placements take place during your fourth and/or fifth year, depending on the company. There is also an optional work placement subject in Environmental Science which can be carried out in a company or research centre.